If you are in love with some amazing wood-fired pizzas then the Uuni 3 is probably the best countertop pizza oven for it. The Uuni 3 Pizza oven review is going to be all about the benefits of the oven and how easy it is to make pizzas in this oven. If you are someone who wants a budget backyard pizza oven that would give you the wood oven flavor and at the same time can make pizzas real quick then the Uuni 3 is a perfect choice. 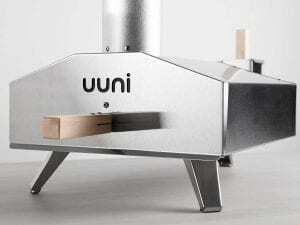 Uuni 3 Pizza Oven was launched on Kickstarter in 2012 and since then it has never looked back. The company was a huge success and these pizza ovens are famous for giving you the best-flavored pizzas in your backyard in less than 60 seconds. Stone baking board size: 33.7 x 33.7 cm / 13.2 x 13.2″. Max clearance above stone: 11 cm / 4.3”. Materials: 430 stainless steel, stainless steel rivets, FSC certified wooden handles, cordierite stone baking board. Uuni 3 is compatible with the forthcoming Gas Burner. 3. Cordierite stone baking board. The Uuni 3 Pizza Oven comes with the stainless steel finish and the entire body is pretty strong and sturdy in comparison to the previous Uuni 2S Pizza Oven. It has a fire pit and the back of the oven and the chimney that opens up at the front so that it can create a nice chamber for the hot air to flow. You are going to be using wooden pellets in order to get the oven started and these pellets are not just plain wood but they are highly compressed wood which gives you more energy than any usual firewood could possibly give you for the same quantity. The fire pit will change color with time and you might not end having the entire oven giving that nice stainless steel finish once you start using it. Although, I must admit that the oven is made up of high-quality materials that are going to last you for the long run. You can start the fire in the narrow firepit with a blow torch and it takes around 15-20 minutes for the wood pellets to burn and reach the best temperature to start cooking the pizzas. Cooking in the oven is pretty easy although you might want to keep a watch on the temperature, the oven can get heated up to 500-degree Celsius which would help you cook pizzas really fast. 1. One has to admit that the Uuni 3 Pizza Oven is really easy to set up and portable. Yes, you can take the oven on a camping trip or any place else of your choice that makes it a portable pizza oven. 2. The oven has an insulated handle on the cover which makes removing the cover easier by just pulling the handle. The cover itself is very useful and absent in many other pizza makers. 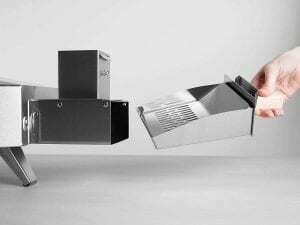 The lid helps keep uniform heat inside the chamber while you are cooking the pizza which ensures that the pizza is cooked evenly and perfectly. 3. Once the oven has reached the optimal temperature, you can cook pizza in just 60 seconds which is pretty amazing and fast. This makes it really easy to host parties and other get together events with this pizza oven. The maximum size of pizza that you can bake in this oven is 12 inches. 4. Setting the oven to the optimal temperature can take up to 15- 20 minutes and once you reach that temperature, you can easily make pizzas in less than a minute. 5. The pizza oven uses energy efficient wood pellets which reduces pollution and smoke. However, the company is soon going to release a propane conversion kit so that you can use the oven with wood pellets and along with the propane gas tank as well. 6. The oven is much more stable in comparison to the Uuni 2 and you can find a lot of improvements in the design of the oven that are pretty visible. 1. You need to constantly turn the pizza every 20 seconds so that the pizza is cooked evenly from all sides. This can get a little tedious if you have way too many pizzas to cook back to back. 2. The pizza oven does not have a temperature control, so you need to monitor the temperature using an external thermometer. 3. The oven handle might feel a little flimsy when you try to pull out the pizza and after using it for a long time. Who is the Unni 3 Pizza Oven for? Do you like to host people at your place and have a fun time? Then the Unni 3 Pizza Oven is perfect for you. Honestly, this pizza oven is amazing if you want to cook a couple of pizzas in just 10 minutes. It is pretty fast which means you can whip up quite a good number of pizzas in just a couple of minutes. It is perfect for pizza enthusiasts, organizing family get-togethers and small parties. The pizza oven will give you the perfect wood oven pizza flavor making your pizza look professional and taste authentic. Probably one of the fastest cooking pizza ovens, Uuni 3 is for someone who has an outdoor counter space to fit this oven that would make them perfect pizzas. Uuni 3 is one of the best pizza ovens that you could get for your backyard. With almost every feature perfectly crafted, this oven is going to be one of the best investments that you would make if you love eating and making homemade pizzas. This pizza oven can easily make pizzas within 60 seconds which is pretty fast. The pizza cooks well provided you keep turning the pizza every 15-20 seconds and the entire oven is powered by high-density wood pellets that you can easily buy online on Amazon. The Uuni 3 is definitely an upgrade from its previous versions and for anyone who is looking for a mid price ranged pizza oven, the Uuni 3 is a perfect choice. If you have used this pizza oven, do let us know how your experience was in the comments section below! Liked this pizza oven? Then share it on your social media and tag your friends who would love a pizza oven at home! I can see you put a lot of effort on this review because you have covered everything about the 3 pizza oven. As a teenage bodybuilder, one of my favorite comfort foods are pizzas, and this seems like an awesome product, but right now I do not have the money. In the mean time, I will come back to read more reviews like this one, and I will definitely get e a 3 oven pizza. Thank you! This sounds like a pretty solid pizza oven. It seems like most “home style” pizza oven nowadays are meant for the outdoors. I think it is pretty awesome. I mean propane gas would make it very convenient, easier to control, and cook faster, but using the compressed wood you mentioned has a nice earthly “natural” feel to it. I mean you pretty much have to rely on the wood the company provides, but if I am out in the open and I run out of compressed wood, I think other materials are still doable. I know that some natural wood out are actually toxic, so I definitely won’t play around with that. However, I can always burn safe materials like bamboo leaves or whatever I can recognize in the wilds. What do you think? Also do think this pizza oven will work with charcoal lumps? Wood pellets are pretty easy to use as well! 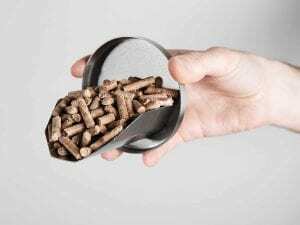 You can always get a bag of wood pellets from Amazon and if you are out in the wild, I would suggest that you carry extra wood pellets. The cabin where you burn the pellets is really small and in order to reach the high temperatures required for cooking pizzas you might want to go with the wood pellets.